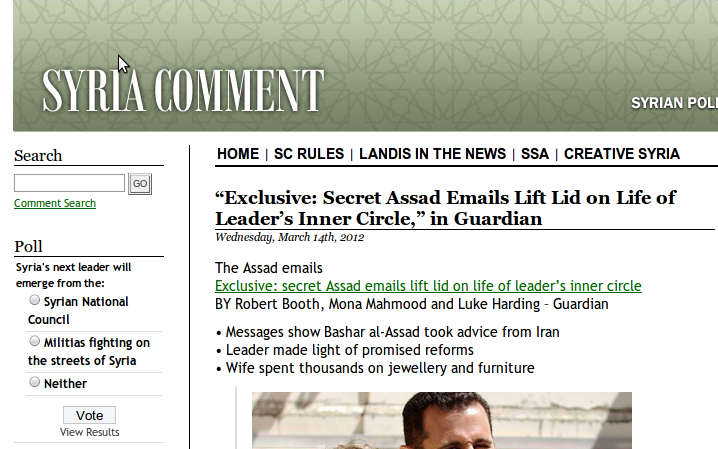 It asks, "Syria's next leader will emerge from the: Syrian National Council; or Militias fighting on the streets of Syria". Because there are only militias on the streets or the SNC in Syria's revolution and nobody else according to the mentality of Assad's spin-doctors. Nonsense. There are nameless Syrians who have been instrumental in organising the peaceful protests that have taken place throughout the country since March 15th 2011. Mark my words, the next president of Syria is organising protests and trying to liaise between the different communities in the country somewhere on the streets of a Syrian town or village. Anti-imperialists and regime-apologists don't want this third category to appear in Syria. They want it to be a choice between an "imperfect" dictatorship and militias or the Muslim Brotherhood.